With Teamup, a shared editorial calendar makes creating content and working collaboratively more efficient for businesses, organizations, and publications. Content is more than a block of text; most of the content we produce, both long and short, involves multiple forms of media. Writers, graphic designers, illustrators, video producers, photographers, editors, and others work together on various aspects of one piece of content. With Teamup, creating content is easier for everyone; Teamup Calendars are flexible, accessible, and can be organized in a customized way. A shared editorial calendar gives a big-picture view to editors and content managers and helps with day-to-day task assignment for all team members. Features like access permissions, event comments, and custom event fields make collaborative planning and workflow tracking easy. There are many ways to set up an editorial calendar. 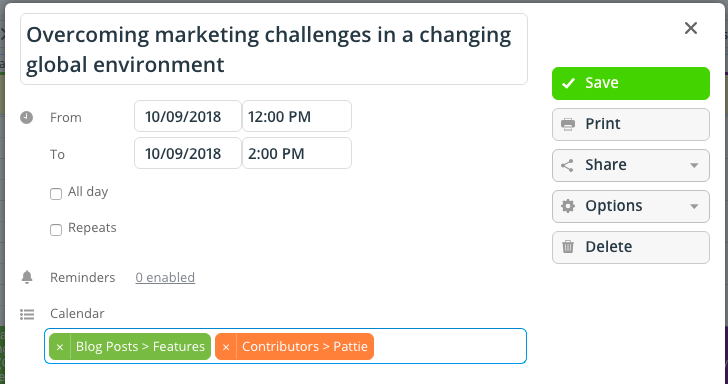 We’ll walk throcugh one possibility, showing how the features and customization options in a Teamup Calendar could work for your editorial needs. 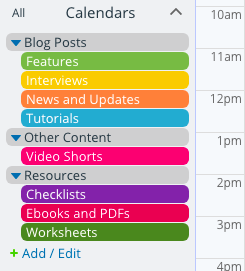 If you produce many types of content, you can organize the content sub-calendars into folders. Use folders to organize various types of content. Create a sub-calendar for each contributor, as well, or for the various teams involved in content production. For example, you could create a sub-calendar for the Design Team, or you could create a separate sub-calendar for each member of the Design Team. Create sub-calendars for individuals or for teams. Next, go to Settings > Event Fields to create new custom event fields to track progress through the content workflow. We’ll create a custom event field with choices, and set it to multiple choice. You can create a custom event field with choices and make it single choice or multiple choice. Now, as each team member completes their part of the content workflow, they can add the relevant option to the event field. 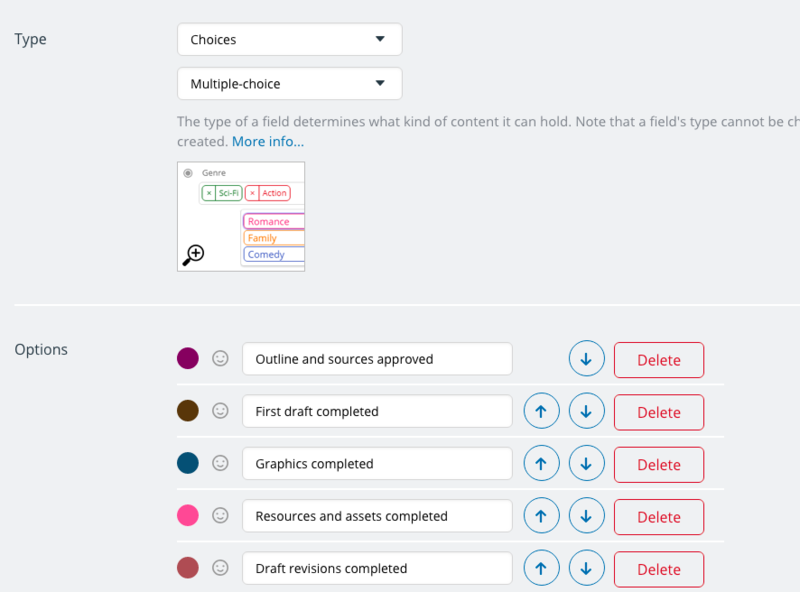 Choose an emoji, a color, and use the arrows to order the options for each custom event field. The name for each custom event field option showing in the event title. The emoji for each custom event field option showing in event title. Using emojis can help to create a quick visual reference without cluttering your calendar with long event titles. You can create other custom event fields, as well. The number of custom event fields you can create depends on your pricing tier: see more information here. Assign work to an individual: if you’ve chosen to create a sub-calendar for a team rather than for each team member, you could use custom event fields to assign work to an individual. 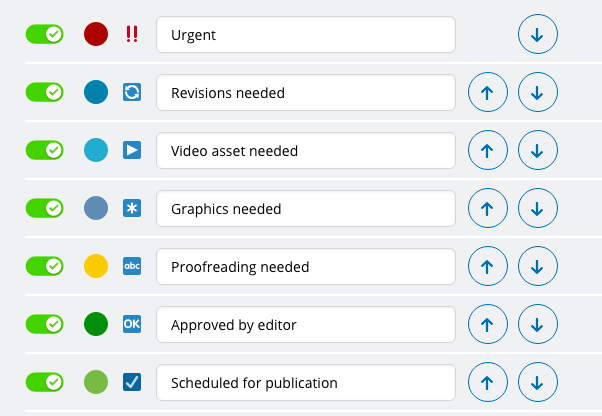 Set deadlines for various stages of the workflow: you could use a single-line text event field to put in a deadline for each workflow stage, then update the deadline as each step is completed. 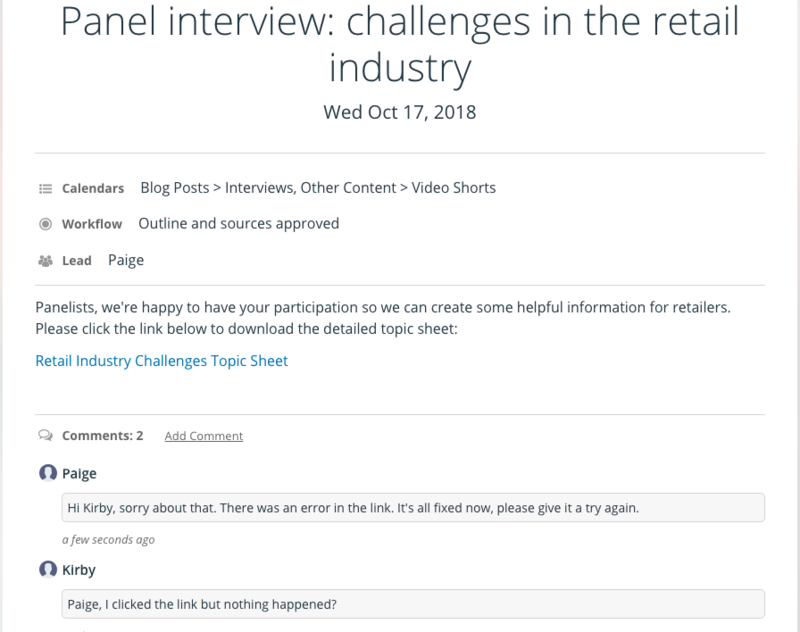 Capture relevant information: input guest contributor information, times and dates for interviews, credit for photographers or other assets, and more. Ensure certain tasks are completed: create a custom event field with various steps that must be completed, such as SEO-related steps or social media scheduling. You can set event comments to be enabled, by default, for every new calendar event by going to Settings > Event Fields, then editing the Comments field. 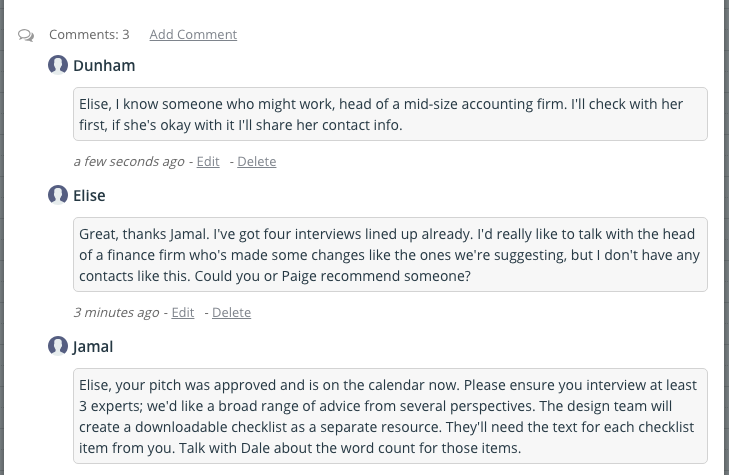 With event comments enabled, your entire content team can have discussions right on the editorial calendar event. There’s no need to take discussion to another messaging service or gather details and comments from an email thread. Keep the discussions in the editorial calendar. If needed, you can even share an event, including event comments, with others who don’t have access to your calendar. This can be an easy, secure way to collaborate with guest contributors. Rather than allowing them calendar access, simply set comments to be visible to all users. Then share the event as a page with the guest contributor. You can share event details without sharing your entire editorial calendar. 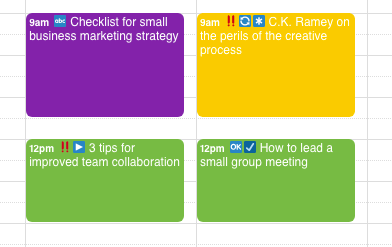 You can add an iCalendar feed for any calendars that influence your content planning. For example, a holiday calendar can help you stay on track with seasonal content planning. You can add inbound iCalendar feeds from other relevant calendars, such as industry news, events, conferences, and calendars for other organizational departments. 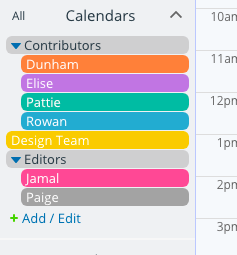 Once you have the editorial calendar set up, you’re ready to share it with your team. Do so by going to Settings > Sharing, then creating a unique calendar link for each individual who needs calendar access. For each calendar link, you choose which sub-calendar to include and you set the level of access permissions, as well. You can set one permission level for all sub-calendars, or you can set a different permission level for each sub-calendar. Customize calendar access for each team member. You can set read-only permission for a sub-calendar that someone needs to see, but not modify or add anything to. Then set other sub-calendars to modify or add-only. Be sure not to share the calendar administrator link with anyone; the administrator link provides full access to all calendar settings. Create a daily-use calendar link for yourself, with full modify permissions for all sub-calendars, and keep your administrator link secure for use when you need to adjust the calendar settings. Now you’re ready to start using the editorial calendar you’ve created. You’ll probably start by scheduling your most important types of content. You can easily switch between calendar views to see the big picture or to see more details. You can toggle sub-calendars on and off to focus on one type of content at at time. In the browser, you can drag and drop items from one date to another, if you need to adjust the publication schedule. Use the Scheduler view to see everything in a neat column. You can drag and drop from one column to another. 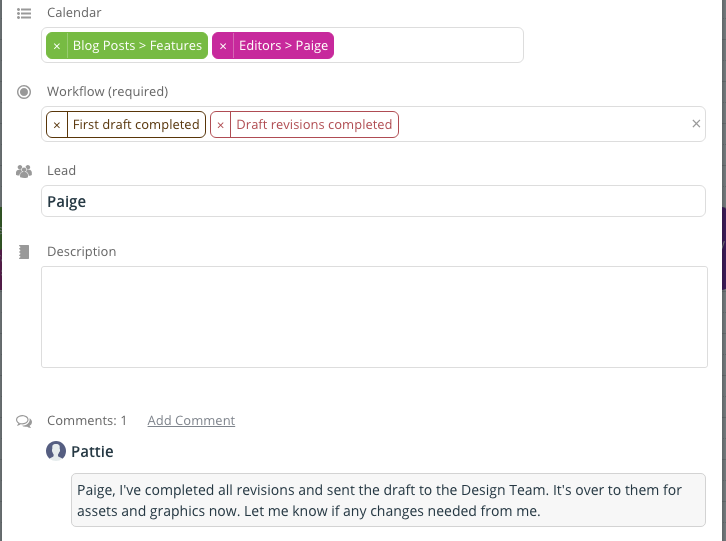 Add content to a contributor’s sub-calendar to assign work. When a contributor completes their work, they can remove the event from their sub-calendar and assign it to the next contributor. Or, if you want to oversee those task transitions, you can have them add the event to your sub-calendar so you can check the work that’s been done, then assign it to the next team member. Comments and sub-calendars keep tasks flowing. Teamup Calendar gives the power back to you with unique features that make sharing and collaborating easy. Customization is built-in, so you can set up and use an editorial calendar in a way that works best for you and your team. 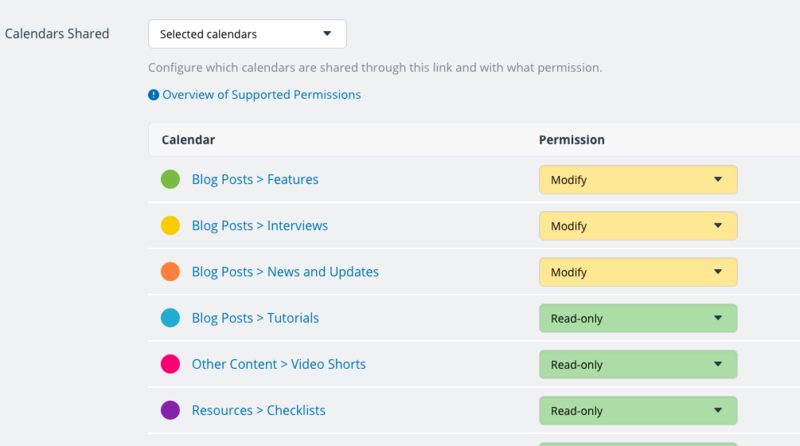 Whether you’re the sole contributing editor on a small content team, or the head of marketing for a major corporation, you can scale a Teamup Calendar to work for your content system and make content planning and production more efficient. Questions? 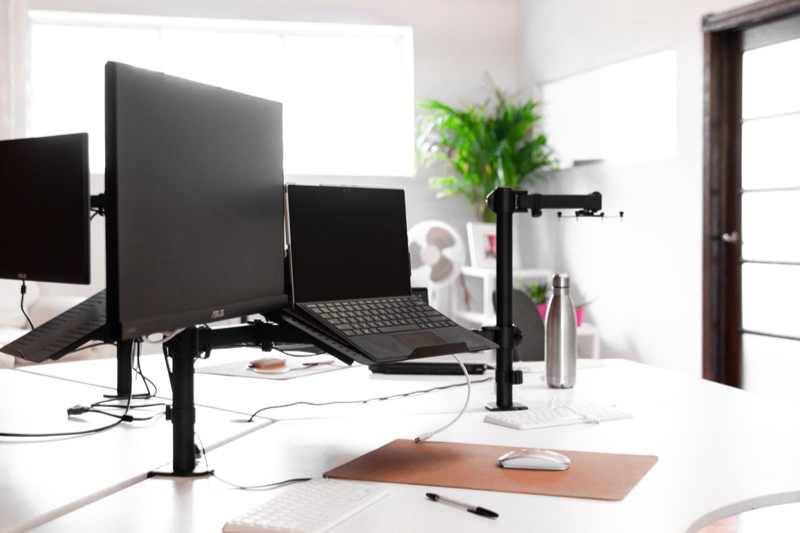 Let us know how we can help, or try out one of our live demos to see all the features in action. Header photo by Phil Desforges on Unsplash.